October 23, 2017 – This week, our time machine shuttles back and forth between the 1880s and the 1980s, with a story anchored at the ends of family trees and DNA strands. 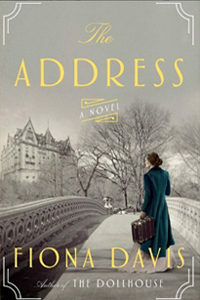 Our guide on this journey is Fiona Davis, author of The Address: A Novel . It builds a bridge between two women, united across a century by the legendary Dakota apartment building. Famous today as the home to celebrities and artists — and infamous as the spot John Lennon met his doom — it was originally a Guided Age an enigma, plopped in the middle of Upper Manhattan’s muddy fields, still dotted with ramshackle farmhouses. By the 1980s, the Dakota had fallen into sooty disrepair, and found its grand apartments suffering architectural indignities like lime green shag carpets, bamboo walls, and mirrored closets. The Address follows on the heels of Fiona Davis’s acclaimed first book, The Dollhouse , about the famed Barbizon Hotel for Women. Born in Canada and raised in places as far-flung as Utah, Texas, and New Jersey, our guest worked for years as an actress on Broadway, and attended both the College of William & Mary and the Columbia University School of Journalism. Find her online at FionaDavis.net, Facebook.com/FionaDavisAuthor, or @FionaJDavis on Twitter.